16 Book Set. Families will become involved in a circle of knowledge using these visuals to support family engagement and child development. Within the context of their family and cultural environment families will interact and dialogue about their relationships. 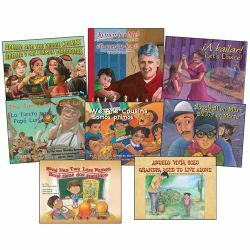 This collection builds on family support and values parental involvement. Hardcover, Titles Include: °A bailar!/Let's Dance!, A Surprise for Teresita/Una sorpresa para Teresita, Abuelo vivía solo/Grandpa Used to Live Alone, Adelita and the Veggie Cousins/Adelita y las primas verduritas, Baseball on Mars/Béisbol en Marte, Francisco's Kites/Las cometas de Francisco, Mis abuelos y yo/My Grandparents and I, Mis papitos: Héroes de la cosecha/My Parents: Heroes of the Harvest, My Tata's Guitar/La guitarra de mi tata, René Has Two Last Names/René tiene dos apellidos, Sunflowers/Girasoles, The Party for Papá Luis/La fiesta para Papá Luis, The Place Where You Live/El lugar donde vives, The Story Circle/El círculo de cuentos, Un día con mis tías/A Day with My Aunts We Are Cousins/Somos Primos.